The band was formed in England at the tail end of the '70s by Richard Hudson, John Ford and Terry Cassidy. Hudson and Ford had been members of The Strawbs before moving on as a duo, scoring a handful of hits in the '70s. They then formed a New Wave-influenced band called The Monks with Terry Cassidy. No, this was not the same Monks that are best known for their insane '60s Garage Rock and questionable haircuts. This was an entirely different band. Hudson, Ford and Cassidy's Monks scored a few hits (and sold very very well in Canada, I might add) but, being talented musicians and songwriters, there was more to these three maestros than anyone could imagine. 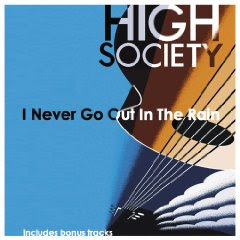 Well, thanks to Angel Air Records, we can all relive the heyday of HIGH SOCIETY with this 2009 reissue of their album, now titled I Never Go Out In The Rain, along with some nifty bonus tracks. And let me tell you, although the style of the music reaches back to the '30s, the actual production of the album is so superb, you'd never guess that many of these tracks are nearly 30 years old! This is truly timeless stuff. Other bands would reach back into the archives and re-record some classic songs of that era, but not High Society. Hudson, Ford and Cassidy actually wrote all original songs that sound so authentic, you could fool your dear ol' granny! And the songs are really fab, too! "Got To Get Out Of This Rut", "Sitting On A Rainbow", "Down By The River" and "Top Hat & Tails" are just a few of the tracks that are on constant rotation here at Spaz Central. And even Mrs. Spaz is digging it, too! If you are not feeling adventurous, it might become tiresome halfway through, but if you approach it with an open mind and let the music lift you and sweep you away, then you will be quite surprised on just how fun this ride really is!